Our highly experienced and uniformed team provides exceptional levels of service and ensure you are fully satisfied with the results. 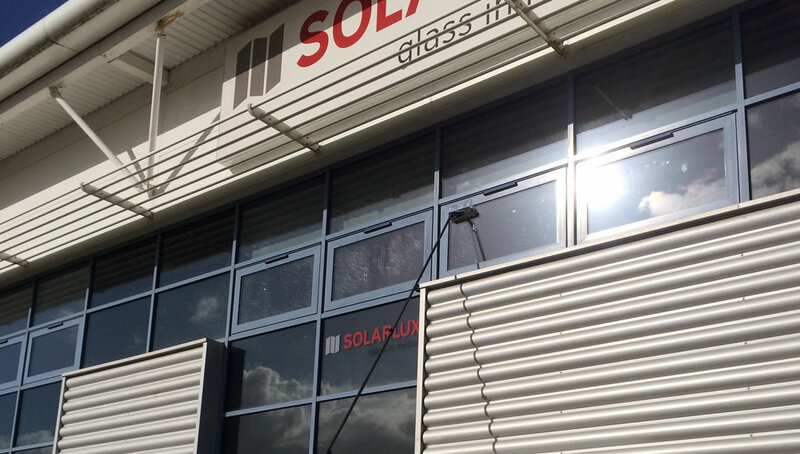 We offer an unparalleled window cleaning service to our commercial clients and have extensive experience working in commercial, industrial and retail sectors. The Thermopure Reach & Wash cleaning system we operate, using hot water for improved cleaning, is highly effective for most applications. On occasions when cleaning may need to be carried out at a higher level than water-fed poles can reach, we have access equipment to enable cleaning at the height required. All staff are fully trained to work safely from the ground up. We have insurance cover to the value of £2 million for all works undertaken and are fully compliant with Health & Safety working practices and regulations. We can work on an ad hoc or contractual basis, depending on your requirements, and offer a range of complimentary cleaning services, including external cleaning of walls, cladding, paths, driveways and car parks. Other cleaning services can be arranged to meet with our clients’ needs. We offer a free on-site audit for our commercial clients and will provide a competitive no obligation quotation. We welcome the opportunity to discuss your window cleaning needs – please call us on 01462 713 376.